Chelsea football club won a vital cup-game after a poor first-half performance. 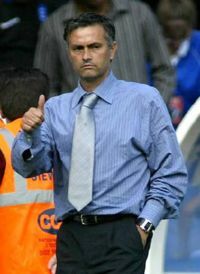 Much of the change in performance was attributed to the influence exerted by charismatic coach Jose Mourinho through his half-time exhortation. This appears to be a case example of a leader’s inspiring influence. But is it as simple as all that? Are there lessons others can learn and imitate successfully? For forty-five minutes, the current champions of the English Premiership played like the underdogs (which they weren’t) and almost like the away team (which they also weren’t). The visitors, Porto, cashed in on their superiority through a well-taken goal after fifteen minutes, a lead they held until the half-time. Coach Jose Mourinho had been captured by TV cameras grimly heading for the changing rooms, a few minutes before the half-time interval. The ITV commentator suggested that the result would depend on what the gifted coach could do to change the performance of the ailing team. From the start of second half, Chelsea upped their game. Within a few minutes their increased pressure was followed by a goal. If there is such a thing as momentum within a sporting contest, Chelsea had achieved it and was benefiting from it. A goal for either side would win the two-leg tie, and the team would advance into the quarter-finals of the European Cup. The well-worked goal from Captain Michael Ballack was the inevitable winner. Victory had been billed as a critical factor for the team to achieve its lofty aspirations, following the three years of bank-rolling by billionaire owner Roman Abramovitch. Speculation had been growing that Mourinho’s future at the club was in doubt regardless of the result, although failure would have reduced his chances even more. Mourinho was happy to explain subsequently what happened at half-time. His team appeared to need a jolt to help them out of a psychologically bad place. How might we explain the change in the team’s performance? One explanation fits with the charismatic model of leadership. The great leader inspires his followers through his own personality and stirring performance. The overall impact extends far beyond the words, to the instantaneous impression created by the leader. According to this sort of model, the result of the leader’s ‘speech act’ was to trigger an immediate change in behavior in the players. Through his shrewd psychological insight, and ‘giving them something to think about’ the players responded. If we look a little more carefully, we may feel there are other factors to consider. Both Mourinho and opposing coach Jesualdo Ferreira felt that another change had also been important. At half-time, Jon Obi Michel was introduced, giving Chelsea the lacking dynamism from mid-field. The situation is complex and unclear, suggesting that it is some combination of the substitution of Michel, and the half-time leadership intervention which taken together achieved the desired change. The evidence seems to support Mourinho’s self-assessment as a Special One. Some leaders may have hit on a tactical shift to help put things right at half-time. Other leaders might have well-developed psychological sensitivity (emotional intelligence?). I suggest that the combination of tactical astuteness and psychological astuteness is particularly rare. So, yes, I’d say that the overall impact Mourinho had on the result was in this instance significant, and also one likely to have been matched by a minority of coaches at any level of the game. What might we learn from Jose? This is an important question for those wannabe leaders in football and beyond. Mourinho acknowledges how much he learned strategically and tactically from his mentor, the former England coach Bobby Robson. (At, among other clubs Porto). The half-time team-talk has a ring to it that sounds equally authentic if we imagine it had been delivered by Sir Bobby. This is evidence which suggests that leadership performance (at least, on the Football field) can be learned and developed, even by a special one such as Jose Mourinho. What of the rest of us? Among the less gifted, those who believe they can learn such things from their role models are probably right. Those who believe they can’t … well they are also probably right as well. So the Special one’s been at it again. In his own words, he’s up there in a group of no less than eight and no more than fourteen. He may be talking of today’s managers. Or he may be talking about where he is in the all-time great rankings. In either case, it would be nice to have some rules for working out whether Jose Mourinho has got it right. Here are a few suggestions. This is not going to be very exciting. On the other hand, you might find it useful if you ever find yourself in a fighting talk situation. Otherwise you may want to save it for after the end of the season. Which, according to some Watford fans, has already arrived. Anyway, yerwego. Letsby Avenue. According to an excellent Arsenal website, Jose Mourhino has been winding up the opposition prior to the Carling Cup final. The BBC also picked up, and provided the excellent image above of Jose and Arsene both looking suitably wise. On reflection, Jose wound me up, prompting this post. You can decide the greatest anything – once you know what the rules of the game are. The greatest is the one left, when you have shown all the others are not so great. Take the London Marathon. The winner is the runner who is not finishing behind anyone else. Or in the long jump, he or she is the one whose longer jump is longer than everyone else’s. And so on. Apply the rule and spot the champion. But it’s not as simple as that is it? No, sorry, it’s not. For example, today we heard that this year at Wimbledon, the best female tennis player of the tournament this year will get the same prize money as the best male tennis player. I’ve listened to lots of people say that’s right, and lots saying that’s wrong. The rule of last one standing (or actually the last flopping down on the hallowed grass in a practiced victory routine) sorts out the best in each of the competitions. But who deserves the most money? The last bloke standing (or flopping? ), simply because the blokes play more sets than the women? Or Roger Federer, because he’s likely to be said bloke, and because he plays fewer sets than any other bloke? Or because he would get ten out of ten for artistic merit for more sets than anyone else. See where I’m coming from? We can’t decide if we can’t even agree what are the rules of the game to arrive at the greatest. The more events and the wider the timeframes, the harder it gets. You mean like picking the greatest footballers of all time? Exactly. I mean like picking the greatest players of all time. And even if we agreed on the rules of the game, we run into the complications of judges interpreting rules. It’s bad enough in Football with one referee having to interpret the rules (with assistance). But what about that Olympic favourite, high diving? The judges practice as hard as the divers, but they still can’t agree all that closely. So picking the best players over time is tricky. You can’t even compare statistics. Some clever maths show that sports become more competitive over time, with less of a spread between best and worse teams playing each regularly. (It may not seem so in the Premier league, but it’s probably the same there as has been shown in other studies). In each case, a general principle can be proposed. Find some way of establishing the what rules are to be used to arrive at the last manager standing. Notice, the problem now shifts from finding the winning manager, to finding the winning rules. See what can be learned from the rules applied to obtain the winner in other situations. Gonks, anoracks, accountants, and attourneys (sorry, members of the legal profession) like rules that involve counting and measuring. The greatest golfer is said to be the one who earns the most dollars in a year. That’s more or less accepted in a year. It doesn’t work over time however. Note, it’s not the golfer who gets the lowest hole average in a year, a method which wouldn’t always get the same result. Note also, it’s not the football team winning the most games that necessarily wins the league or even the World Cup, or the tennis player who wins the most games in a match, tournament or a year. Hm… Boring, isn’t it. There’s no one answer. But we can fix it to get different ‘right answers’ according to different rules. Or how about this approach? You ask the best managers to vote on the very bestest one of all? I think you can see the snag there. How do we pick the best manager. Hm. Or maybe we ask everyone in the world interesting in soccer to send in their votes. Hm, again, lot’s of scope for cheating, and how much do most of those ********’s **** s know about anything anyway? How to see how right Jose is on this one? OK. That’s what you’ve been waiting for. You deserve a serious no messing answer. 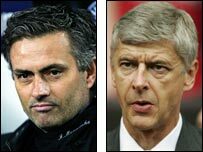 How can we Jose compare with today’s managers; and how to compare him against the all-time greats? This is what I’d do. I’d carry out what’s called a meta-analysis (phew). I’d have two sets of people. One group would be the rule-setters, and the other the rule testers. Each would have fans, players, coaches, pundits, even referees and other officials. Then I’d lock the rule-testers up until they agreed on the rules for picking the bestest manager. They would then be let out. Next, the rule-testers would be locked up to reach the answer as dictated by the rules. Again they could come out when they have reported. Their job is to have a league table of the current day managers. We can then see where Jose fits on that list. This gives us the answer to the first, and simpler question. For the other question, I’m inclined to go for a different approach. I’d get all those game players to play out footie games with teams and managers from all time periods. Using some of the rules already established you could then see who wins out. Oh, yes, if that fails, I’d be inclined to ask Jose what he thinks about it all… Or maybe Arsene. You are currently browsing the archives for the Jose Mourhino category.